Eggplant large and small is a traditional staple in the Greek Diet and can be found in every garden throughout Greece. 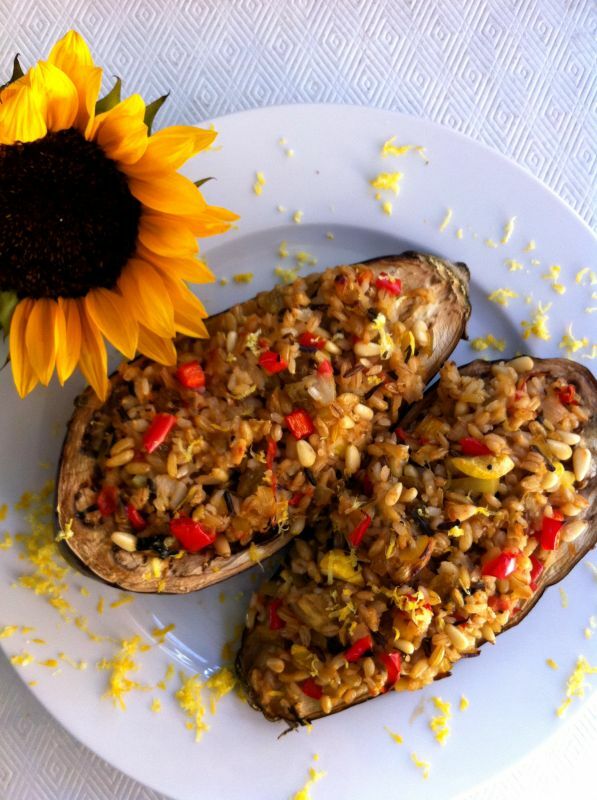 This dish is commonly called “eggplant slippers” for the simple reason that they are stuffed with vegetables and various meats. This recipe is using a more healthful version using three different grains. These grains can be substituted with your favorites, or one grain can be used for the entire quantity. Browse your supermarket or farmer’s market to see what is in season, substituting the vegetables in this recipe with your favorites ones. Try and find nice long, rounded eggplant with firm and glossy skin for the freshest taste. A heathlful substitution of the traditional meat with three grains and vegetables. Place the three grains in a medium saucepan with water to the top, boil, and reduce heat and cook until tender about 1 hour. Drain, add 1 teaspoon of olive oil and stir and set aside. Cut eggplants in half lengthwise.Using a spoon, scoop out the center, leaving ½ inch thick shell. Dice and save the pulp for stuffing. In a skillet, add 1 tablespoon of extra virgin olive oil, add leek, garlic and onion and cook until softened. Add squash, tomato, pulp of the eggplant, red pepper, parsley, mint, lemon juice, liquid aminos or salt, and pepper. Cook for 20-25 minutes until softened. Add the pre-cooked grains and stir. Add ½ water or wine and cook until liquid is absorbed. Add the raisins and pine nuts. Fill each eggplant with stuffing, mounding the stuffing. 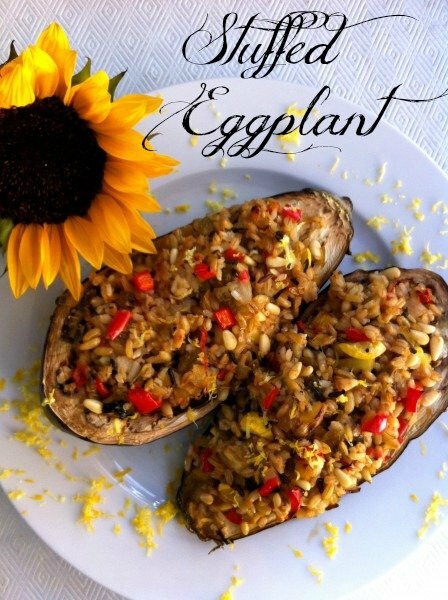 In a skillet heat 2 tablespoons of olive and place eggplant shells in one layer and cook turning once until browned. Place in a baking dish cut side up. Bake in a 350 degree oven for 40-45 minutes until lightly brown on top and eggplant is tender.